by Kurt Jiri Kotouc, Zdenek Ornest, Marie Rut Krizkova | History | This book has not been rated. Really interesting book, though I haven't read the entire thing through. Even the concept just breaks your heart. Sending out for my "I'm moving to a tiny apartment and don't want to move all these books" RABCK! Flewry, thank you! What a fascinating and different perspective of the Holocaust. I'm sure it will be very sad reading, but how much sadder if it had never been published. Unfortunately, my husband rescued this from the front porch in the middle of a driving rainstorm a couple of nights ago. (We used to have a standing request that packages that couldn't be delivered in the mailbox or to a human being be returned to the post office, but apparently the new carrier never got that memo...) Luckily, the book was wrapped in plastic, and only the covers and one corner of the pages got damp. I have it stashed in the freezer to protect it from further water damage until I can get hold of a hair dryer and ease out any remaining moisture, and I think the book will be okay. I'm looking forward to reading this and sharing it - thank you for sharing it with me! This book has an impact that starts subtly, builds slowly, and comes crashing down over you like a wave. I read it in small doses, mostly because the magazine-type format made it easier to read that way, but also because it is a little overwhelming to read a lot at once. For instance, there's a perfectly nice article about one of the Terezin facilities and an interview with its supervisor that could appear in any high school newspaper. Until it hits you that this was written by a 14-year-old boy. About the camp crematorium. There are a lot of pictures of artwork. Mostly perfectly-ordinary-nothing-special artwork, no different from student artwork at any school. Except that so many of these pictures have the word "perished" under the artists' names. Unbelievably sad. 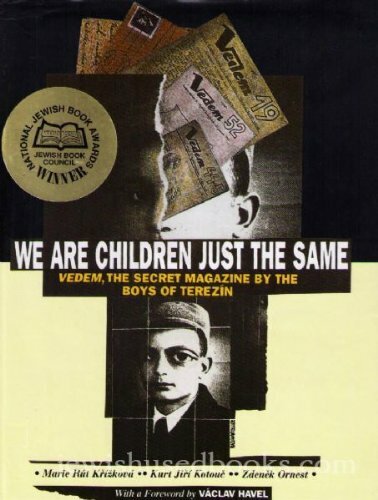 "In all, about fifteen thousand children passed through Terezin...In the winter of 1944-1945 there were 1,086 children left in Terezin, and at the end of the war less than three hundred children over fourteen years old returned from the camps. not a single child under fourteen, unless he or she was among the few lucky ones that had remained behind in Terezin, came back. "None of the effort, none of this collective care for the children's mental and physical welfare, none of the education, both individual and collective, bore fruit. It made the children's stay in the ghetto a little easier. It could not prevent their terrible fate." Thank you for sharing this book with me. It needs to be shared. I will pass it along so it can be shared again. Unfortunately, I cut the waxed paper too long and was not able to stand the book on its head and foot, so it ended up spending some time on its spine. As a result, the covers like to slip back toward the spine and it's just a tiny bit warped. Still very readable, thank goodness. And thank goodness it was mailed in plastic, because after being left on the porch in the driving rain, the outer packaging was completely drenched!